[unpad.ac.id, 8/7/2018] Rector of Universitas Padjadjaran Prof. Tri Hanggono Achmad, officially opened the 18th Asian Games Pre-Event which was held at Unpad Dipati Ukur Campus, Dipati Ukur Street No. 35, this morning. (8/7). This is a form of our commitment in supporting Indonesia’s efforts in organizing the Asian Games,” said Rector. Indonesia, the Rector continued, this year to host the biggest sport event in the continen. This pre-event is expected that spirit of the Games will be born from community of West Java. “Hopefully what we run today really provides energy for Asia,” said Rector. The opening was marked by the ignition of the torch which also a sign of the opening of the Traditional Sport Olympic (Ootrad). 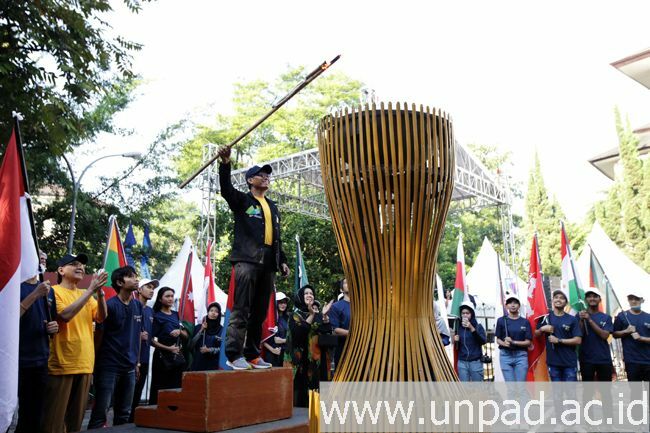 After the torch ignition, the event was followed by a parade of 29 participating countries in the 2018 Asian Games by leaders, academicians, foreign students, and educational staffs in Unpad and community representatives. The Parade took the route from the south parking lot of Unpad Dipati Ukur campus to Car Free Day Dago area and it stopped at Cikapayang Park. The parade returned to Unpad campus via Hasanudin road.